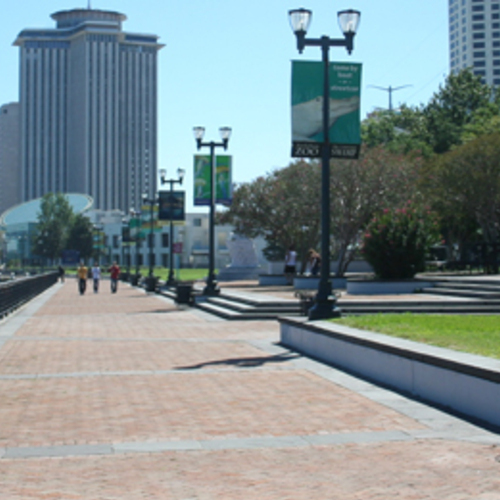 Woldenberg Riverfront Park is 16 acres of sprawling green space stretching between the Mississippi River and the historic French Quarter. Begin or end your walk in the Park with a visit to Audubon Aquarium of the Americas or Entergy IMAX® Theatre, both adjacent to the Park. The riverside jogging path is popular with city dwellers, as are the sculptures and artwork. Don’t be surprised if the sights include a strolling band, impromptu second line or a bustling festival! Prime location makes Woldenberg Riverfront Park a perfect setting to escape and unwind.